The problem is, I get to 7 o’clock at night and I’m knackered. I don’t have the brain power to keep editing or writing my book, I’m usually trying to ignore the fact that I have dishes to wash and washing to fold, and sometimes I’ve run out of reading material. Gasp! So, I taught myself to crochet using YouTube tutorials. I’d tried to learn before, but hadn’t kept it up long enough for it to stick. This time I was determined. I was going to learn, and create pretty things, and be the crochet queen if it killed me. Thankfully it was actually pretty easy to pick up, and there was no death by crochet involved. By the end of one rainy weekend I was crocheting granny squares without too many re-do’s. Fast forward several months and I can still only crochet granny squares. I’m sure I could actually branch out and try something new, but I can now do Granny Squares in my sleep and this has opened up a whole new use for crochet. It is no longer just something I can do at night time, but something I can also take with me during the day. Let me explain. When I’m not at home writing books, I’m a nanny, (this is what pays the bills). I take my little charge to playgroup and the park, the aquarium and the swimming pool. It is generally a very rewarding job, but it can get lonely. Spending 3 hours a day at a playground may seem awesome, but when you’ve got no other adults to talk to it can really drag. And idle hands and an idle mind are not conducive to happiness. I end up thinking waaay too much, and it’s not usually about good things. And then I check my emails, look at Instagram, take photos of my little one and send them to his parents, and then I’m back to doing nothing. Crochet has changed that. I can tuck the ball of wool under my arm, walk around the playground after him and keep my fingers busy. I have to concentrate on what I’m doing enough that my minds not going in circles, but not so much that I can’t interact with the world. And if he needs me I can simply drop it into my bag and pick it up again later. Even if some of it comes apart it’s not hard to fix. And every single one of these things helps boost your mood and strengthens your mental health. How awesome is that! Learning new skills is important for every person. They help you grow and develop, and provide a sense of accomplishment. They also boost our self-esteem and our self-worth. Give it a try- find a tutorial or borrow a book and learn just one new thing today. It’s very rewarding! Rumination is one of those things that is so easy to do but so bad for you mentally. Giving your brain something else to focus on helps stop that cycle of negative thoughts. See my Rumination blog for more info. While phones can be fabulous for keeping in touch we use them far more than we should. The magical (read staged) moments that make up social media keep us feeling ‘less than’ because we are constantly comparing our lives to others. What you can’t see is behind the scenes. They have bad moments, days, weeks too. But none of that makes it onto social media, so all we’re seeing is the highlight reel. And as if this wasn’t enough, constantly looking at our phones signals to others than we’re busy, so chance interactions and conversations we may have had, become even more slim. 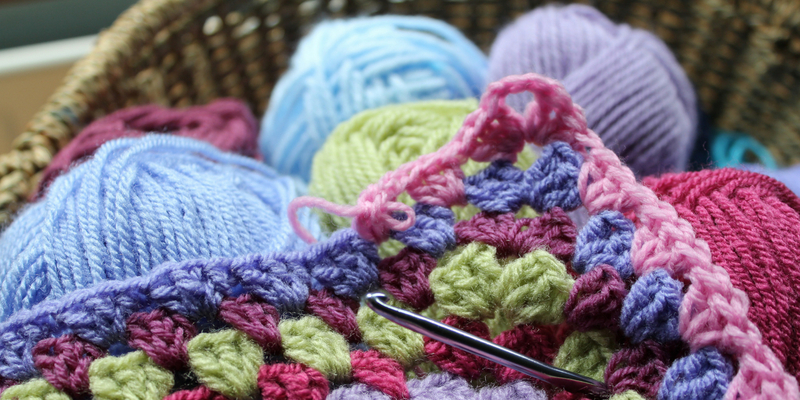 Doing crochet on the other hand has opened me up to social interaction even more, as it is a great talking point. People will come up to me and ask what I’m making or comment on how their mother/grandmother/sister/friend does crochet but they’d never learnt and wished they could do it. And that’s all it takes to start a conversation. One little icebreaker. And sometimes it never goes much further and sometimes you chat for an hour, but it helps regardless. You’ve talked to another human, you’ve generally smiled, you’ve reminded yourself that you are creating something tangible- you clever thing you. All these little things help boost our mood. And if no-one stops for a chat that’s fine too. Because you’ve got something to do, loneliness is not such a big factor. And strangely, the days that I crochet are the days I find myself smiling at nice thoughts, planning for the future, and being more mindful of the beautiful world around me. I’m just in a better mood. I ‘m not sure why it makes such a huge difference but I’m not questioning it. I’ll take it! I love that I’m working towards a goal too. Yes, I might just be doing granny squares, but one day (in the very distant future) I’ll have enough to make a blanket. And that’s another thing I think of while crocheting. What pattern should I make? What colours should I use? Should I put polar fleece on the back of the blanket to make it super snuggly? Ultimately it doesn’t matter. In fact, it doesn’t even matter if I never finish the blanket. The simple act of working towards a goal is enough to lift flagging spirits. Try setting yourself both big and small goals and then start actioning them one step at a time. It feels awesome! What started out as something to fill evenings has morphed into so much more. I never thought crochet of all things could lift my mood to the extent that it has. It just goes to show that sometimes it’s the little things that benefit us most. So even though I look like a granny, I will continue to walk around the park with a ball of wool under my arm and a smile on my face. Come up and say hi if you see me and we’ll chat about your grandmother and her ugly woollen blankets. Next Next post: Kick Down Some Doors!